We're off to the races at the fifth-annual Dwell on Design conference, currently underway at the Los Angeles Convention Center. Friday was open to the trade only, while Saturday's doors open to any and all that wish to attend a weekend's worth of design-related activities. Though it only scratches the surface, we'd like to share a slideshow of images captured on the show floor. Stay tuned to dwell.com or follow @dwell as we post updates from #dwellondesign. 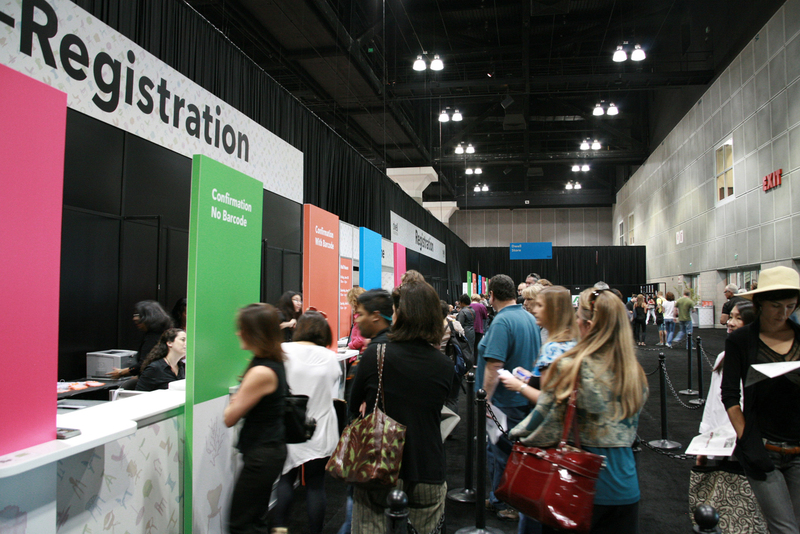 The first throng of attendees appeared a bit before 10 a.m., when the doors to Dwell on Design opened. The hall filled up quickly—over 200 exhibitors were set up and waiting. Dwell's president and CEO, Michela O'Connor Abrams, kicked things off at the HP Lounge with a few announcements. One such announcement celebrated Dwell Patterns by Heath Ceramics, just unveiled for Dwell on Design. A collaboration between architect and designer Christopher Deam, Robin Petravic and Catherine Bailey, of Heath Ceramics, the tiles are on view on the show floor. California–based design company Wallter debuted a new line of powder-coated spun-aluminum planters. Stay tuned for tomorrow, when we'll post an interview by associate editor Miyoko Ohtake and husband-wife design team Max and Linda Geiser. New handcrafted pieces from Cerno were an understated treat. A trio ponders the merits of an angular metal side table, just adjacent to the Modern Family Zone. Remember, kids under sixteen get into Dwell on Design for free! Inside the exhibition hall, oversize covers of past dwell issues hang overhead. At the space shared by Touch and Inhabitat, the new Open Stool was on display. Check out assistant editor Jordan Kushin's review from the show floor to read more. Associate editor Miyoko Ohtake somehow managed to stop by the method booth to chat with the company's design director, Sally Clarke. Read their interview here. At Room & Board, attendees could enter to win $1,000 worth of merchandise. Handcrafted pieces by Viash Studios, including a white-aluminum-and-walnut console table and desk, were on display as part of the company's LAX series. Always welcome at any show floor is a phalanx of comfy seating. Panasonic had the right idea. Keep watching dwell.com for more sights from the show floor, interviews with exhibitors, thoughts on panel discussions, and the like. If you can't make it to the Los Angeles Convention Center, follow the updates from @dwell as we tweet from #dwellondesign.